Searching for an old shipmate, friend or relative who played in a Navy band? Congratulations: you've come to the wrong place. Just kidding. I love hearing from people who are looking for information about long-lost Navy musicians. Unfortunately, I usually don't know the whereabouts of your long-lost pal Clem, the CRUDESPACRONAIRLANT piccolo player during the War of 1812. It's a big world out there. 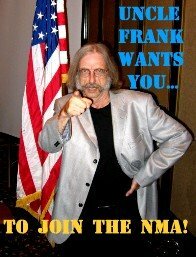 The membership roster lists hundreds of names and email addresses of former and present Navy musicians who belong to the NMA. The message board allows visitors to post information about their search for Navy bandsman. The page gives instructions on contacting the webmaster. This social networking site grows more valuable each day. Individual MUs have their own pages. Specialty groups abound: Former U.S. Navy Musicians, Military Musicians, and individual band pages (for example, U.S. Navy Band San Francisco and Sixth Fleet Navy Band Alumni). Can't find a helpful group? Start your own group. Other social networking sites and specialty sites may be of help (MySpace and TogetherWeServed.com come to mind). Many sites are of limited value. Online ship rosters, for instance, are notoriously incomplete, generally incluing only those names submitted by former crewmembers themselves. Happy hunting for your bunkmate on Old Ironsides. If you find a valuable source, let me know, and I'll include it here. Is there any info or story about MUC Sid Zerambe in the NMA Archives.l think he retired in the 60's with 40 yrs. service.